The police advise that most burglaries are opportunist. Who’s looking in your windows? 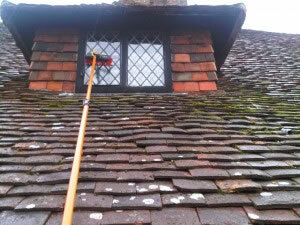 Traditional window cleaners work with their faces close to the window. Because they climb up ladders and they can see in every room in your house. Has a face suddenly appeared at the window? Is he easy to contact? Has he told you on which day he’ll arrive? Have you ever had a face suddenly appear at the window? At The Window Cleaning Company, our customers know in advance when we’ll arrive. We notify the next wash date in writing on every visit. For those with security issues, such as a locked gate, we advise again by text a few days beforehand. Our staff are CRB cleared. We advise when we arrive and when we leave. The van is clearly sign written. We wash with brushes up to 50′ long, which means we don’t peer through your bedroom windows. So the choice is clear – take a chance with the man and his ladder, or enjoy your security and gleaming windows from The Window Cleaning Company.